The Klezmer Conservatory Band will celebrate its 30th anniversary with a special performance during the Boston Jewish Music Festival. Jewish music, in many people’s minds, is a thin sliver of a small slice of the musical pie: a cantor’s liturgical wail, the rousing sound of klezmer, end of story. The Boston Jewish Music Festival, which debuts tomorrow and continues through the week, should go a long way toward changing that misguided impression with a lineup that embraces Judaism’s exploding musical landscape while honoring ancient traditions. “We might have the only advisory board that has a Chabad rabbi and a Reconstructionist rabbi,’’ says festival cofounder Joey Baron. Reaching the broadest possible swath of the Jewish community is a central part of the festival’s mission. To that end the BJMF booked concerts that run the gamut from Brooklyn’s Electro Morocco to 85-year-old Ladino artist Flory Jagoda, rising singer-songwriter Ruth Dolores Weiss to classical composer Osvaldo Golijov. Ernest Bloch’s choral masterpiece “Sacred Service,’’ performed by Chorus Pro Musica, Zamir Chorale, and the New England Philharmonic Orchestra, will bring the festival to a close. Jewish youth culture has surged over the last decade with the launch of Heeb and Tablet magazines, JDub Records, and the wildly popular Hasidic rapper Matisyahu, and the BJMF aims to draw provocative connections between new and old with creative programming. The festival’s opening night, at Berklee Performance Center, features a 30th-anniversary performance by the Klezmer Conservatory Band (joined by original members Don Byron and Judy Bressler) along with Golem, a young New York band that infuses the form with irrepressible wit and punk-rock vigor. Boston is late to the game. 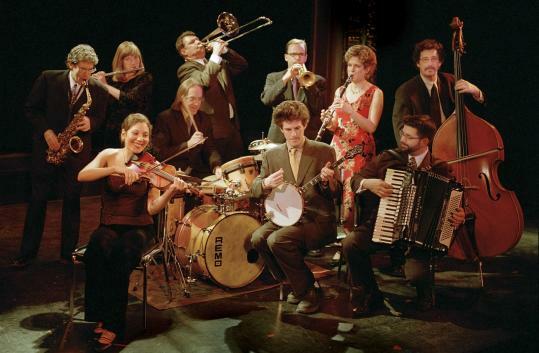 While many major cities have established Jewish music festivals, it’s taken a long time for the Jewish community’s leadership here to acknowledge that such events are an essential part of Jewish life, according to Hankus Netsky, founder of the Klezmer Conservatory Band and a member of the festival’s board of directors. Like many milestones in Jewish life, the Boston Jewish Music Festival has roots in food and angst: specifically, a nice challah and a midlife crisis. A year ago, Baron, a former advertising copywriter who had found himself at a personal and professional crossroads, was standing in line behind Joshua Jacobson, director of the Zamir Chorale, at Blacker’s Bakeshop in Newton. When Baron introduced himself and mentioned that he had been thinking about trying to start a music festival, Jacobson offered to put Baron in touch with his friend Jim Ball, a freelance marketing consultant and musician, who happened to be toying with the same idea. The pair, both deeply involved in Jewish community and spiritual life, put the festival together in eight months. They secured partners and sponsors despite the down economy and a chorus of skeptics telling them they didn’t have time to build a sufficient base. Baron, a seasoned producer of local Jewish music events, reminded naysayers that Woody Guthrie became popular during the Depression, and that good art becomes even more vital to people’s tenuous sense of well-being during hard times. The community rallied. Two of the major events were essentially well-timed gifts from other organizations: Chorus Pro Musica, which is not a Jewish group but was interested in undertaking Bloch’s “Sacred Service,’’ was looking for a marketing partner in the Jewish community, and the New Center for Arts and Culture had already planned the Golijov appearance with the Borromeo String Quartet as part of its spring program. Joan Anderman can be reached at anderman@globe.com.